IGST on inter state supplies in India. GST has been implemented in India from 1st July, 2017. Under the new GST regime. 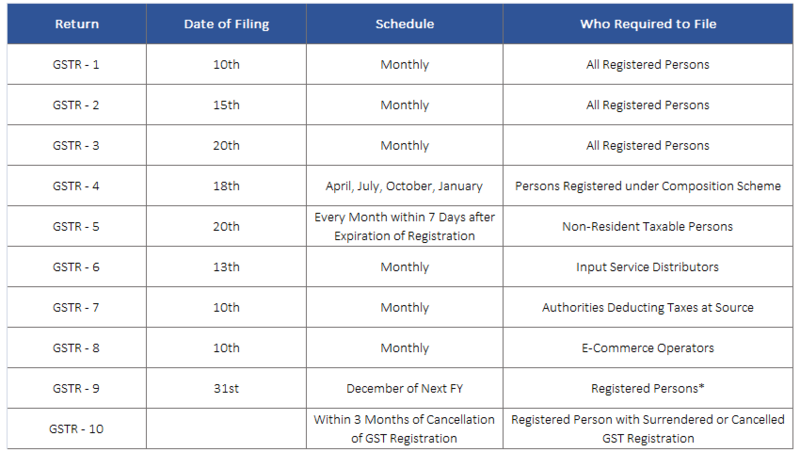 All entities having GST registration are required to file GST returns, as per the GST return due date schedule. Each business registered under GST will be required to file returns on timelines mentioned. Each month outward supply (sales), Inward supply (purchases) and final return to be filed by each registered person. In addition there are different categories of returns to be filed by different persons, like composite return, ISD return, Annual Return. The detailed schedule along with forms and timeline is mentioned below. Get a free consultation on GST return filing by scheduling an appointment with an RG Consultants GST experts. With the implementation of GST in India, the indirect taxes would be streamlined and standardized. Under GST regime, businesses would no longer have to obtain multiple VAT registration in different States or obtain a separate VAT and Service Tax registration. A single GST registration would be sufficient across India for selling or purchasing goods or providing services. Subsumes various other taxes like Central Sales Tax, Additional Customs Duty, Purchase Tax, Luxury Tax, etc., Hence, under GST, many of the taxes in existence today would be subsumed and made into one tax. This would make tax collection and compliance easy for businesses across the country. Currently, many businesses like restaurants, computer sales and services businesses have to comply with both VAT and Service Tax regulations. This creates a compliance burden on the business, as they have to calculate taxes for the transaction based on different rates for different items. Under GST, the distinction between goods and services will be gone – making doing business easy. Currently in some states under the VAT regime, businesses are required to comply with VAT regulations once they cross an annual turnover of Rs.5 lakhs. Under GST regime, GST liability accrues only if an entity crosses an annual turnover of Rs.10 lakhs in northeast or hill states, whereas for rest of India, the threshold is set at Rs.20 lakhs. GST is expected to increase the tax base in India significantly. Hence, the overall tax liability for businesses is expected to reduce overtime, as more and more businesses become compliant. Further, GST will use the latest in technology, including data from Aadhaar database, PAN database, etc., to make GST registration and GST return filing process, as seamless as possible.